HOGSS patent pending system was developed to meet the growing needs of small waste removal projects, by Michael Brothers Hauling, Inc. MBHI is a family owned and operated company based in Pittsburgh, Pennsylvania. The HOGSS idea was created after seeing a new concept in Europe which was to use a large crane truck to pick-up a bag in place of a dumpster for small construction projects. However, MBHI wanted to improve the design of the bag as well as create a new property friendly method of picking up the bags. 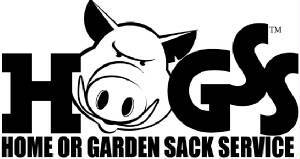 Michael Brothers contracted a company to specifically design and manufacture the bags now called HOG Sacks. The sacks are larger, stronger and designed with a lid to help keep the job site clean. After exploring many ways to pick-up the sacks, the team at MBHI decided that there was no other system available to meet their standards. So they invented the system of using a truck mounted fork-lift equipped with a custom designed and built attachment to pick-up the sacks safely without doing property damage. This is how years of experience and innovation evolved a good idea into a great service called HOGSS.